I’ve been wanting to revisit one of my favourite old-school gaming rules from back in the day, Laserburn. I’ve kept the rules safely tucked away along with my Tunnels and Trolls dungeons, for years. So in the interest of trying to pull together those memories, I’ve been doing some digging on the ye olde internets and compiled this article which I hope you may find interesting. My first memory of Laserburn was when my cousin Carl bought a copy of the rules set from (I think) the Virgin Games store in Birmingham. The store took over from the Midland Educational store (another favourite when I was little) in Corporation Street and soon became a useful source of hard to find gaming material as Games Workshop became more and more a ‘house’ product company. The rules are for 15mm and 25mm miniatures skirmishes, sold as having a RPG element, but I think this was a bit of a sales pitch to widen its appeal. The book is very similar to the TnT rules and solo dungeons; A5 pamphlet style, 40 pages with a cream-coloured card cover. Illustrations are hand-drawn line art and the typsetting reminds me very much of paragraphs stuck together and photocopied. If the copier density was set a little too high, you would see vauge lines bordering the said paragraphs. The rules were cheap – just a few quid apiece, for the main rules set and supplements. Authored by Bryan Ansell and Tony Ackland (the god-like figures of Citadel and Games Workshop fame) and was essentially the forerunner to Warhammer 40K; re-reading the rules I get the feel some elements of the game found their way into the later WH40K. Weapons such as bolt rifles and hand flamer are examples of this. 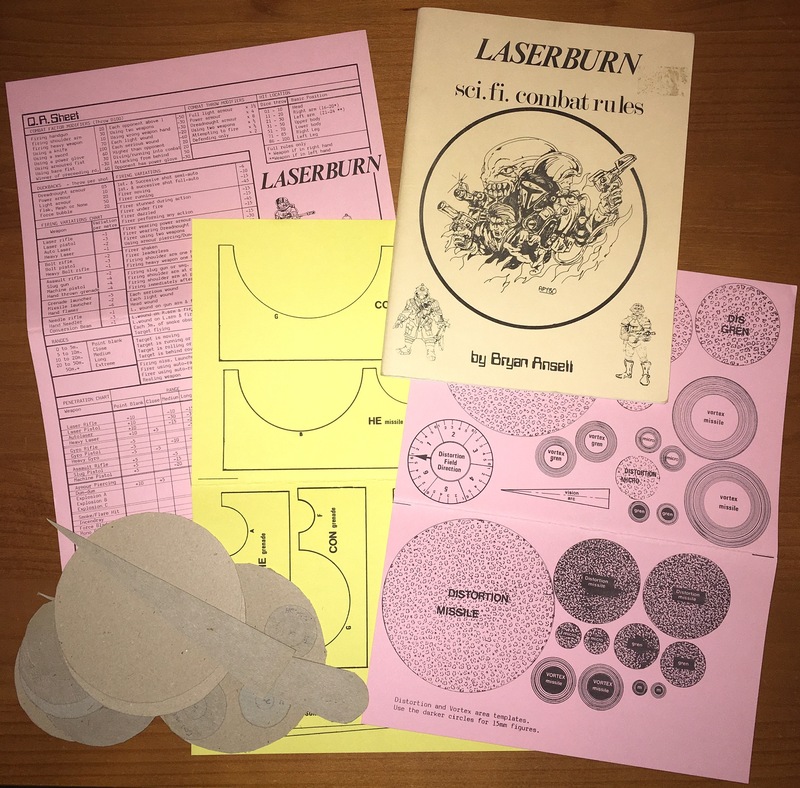 My copy of Laserburn with its quick reference cards and hand-made weapons effects templates. The ‘missing link’ between Laserburn and WH40K, I reckon is the advert from the oft-promised-but-massively delayed ‘Rogue Trader’, Citadels answer to Traveller (snapshot below from the first Citadel Compendium). This was advertised in 1983, but eventually became the first edition for the WH40K universe. Never found out who Dr Gostalo’s Amazing Inter-Galactic Psycho Circus was… and ‘Fear and Loathing in Los Asteros’ sounds like a dodgy club I may have been to in central Birmingham…! 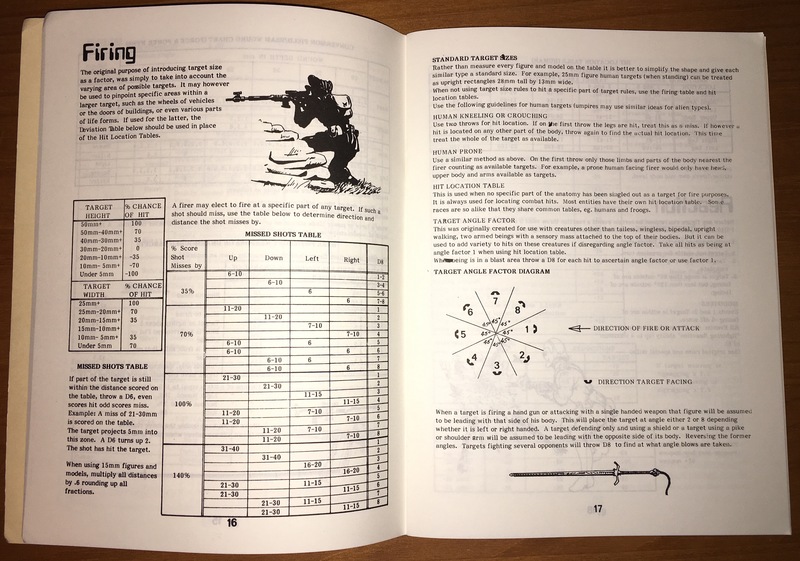 Rather than trying to remember the game mechanics as the last time I played was around 1987, there is an excellent article over at the penultimateharn blog which explains the system and how to play. Because the game encourages the use of templates to determine hits, Carl had cut some card templates for eg. grenade effects or the ‘sun gun’ weapon which I inherited when I bought the Laserburn rules from him. Because of this, I ended up playing the game using 25mm miniatures, rather than the 15mm version, of which I had a load of Traveller boxed sets. For me, this is where it starts to get a little interesting; I had also picked up some 25mm sci-fi miniatures from somewhere, I couldn’t recall exactly where, but I remember most of the miniatures and their poses. 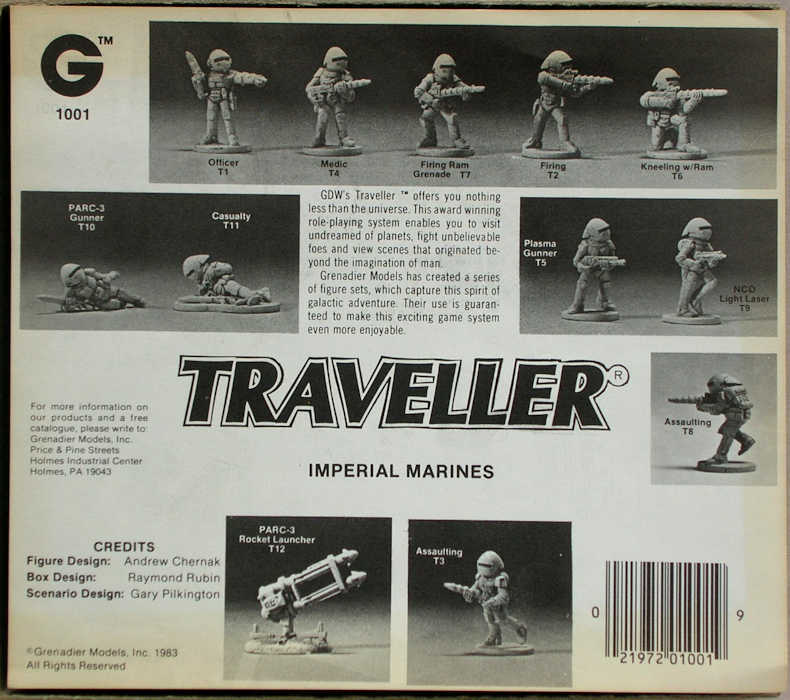 After a bit of searching on t’internet I found them here; it turns out that they were Grenadier 25mm Imperial Marine Traveller figures, which turn out to be quite rare in the UK. I know I’ve got them stashed away in the garage somewhere (I really, really must clear it out one day), I know I have at least the following:- T1 Officer, T4 Medic, Firing T2, Kneeling w/RAM T6, Assulting T8 and PARC-3 Rocket Launcher T12. Image link – www.miniatures-workshop.com – Grenadier Traveller 25mm boxed set. These were painted in an initial white garb scheme, with black limb joints (Star Wars stormtrooper style) and then replaced the white with a red-orange colour scheme (‘cos thats good for camouflage!) I set up a game with my brother using these figures and remember once you got the hang of the rules, it was quite a reasonable system to use. Though the number of games played with the rules was limited, I probably have more affection for the rules because of their ‘rough and ready’ production values. I love the photocopied-bound-with-a-bit-of-card and plain line art, the font used reminds me of the early Citadel catalogues I used to spend hours pouring over, planning my next purchases. Because of these production values and hence cheap book prices, I was able to expand my RPG rules set and if anything, gain a lot of inspiration in other games. On another trip to Virgin Megastore, as the RPG section was gradually winding down, some Laserburn supplements became available (from stuffed in a back room somewhere I guess) which I eagerly purchased as it was the first and last time I would see the LB books on sale in a store. I picked up ‘Advanced Laserburn and Aliens’ and ‘Forces of the Imperium’ from this final sale. The other books are very similar in production values and in some ways to illustrations mirror what miniatures were available at the time. Above – Advanced Laserburn and Aliens page. The production style didn’t change in the three years between the original rules and the publication of this product. 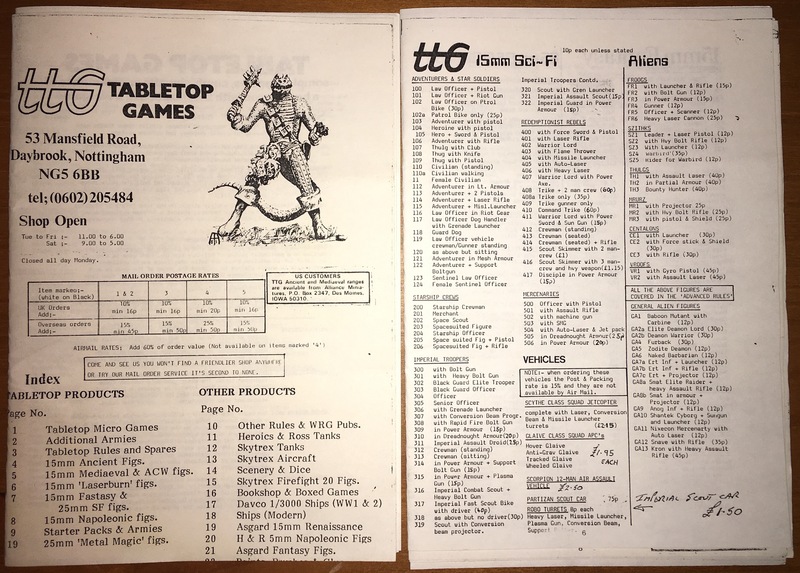 A snap of a TableTop Games (TTG) catalogue and some of their 15mm range, circa mid-80’s, possibly picked up from a Dragonmeet I went to. 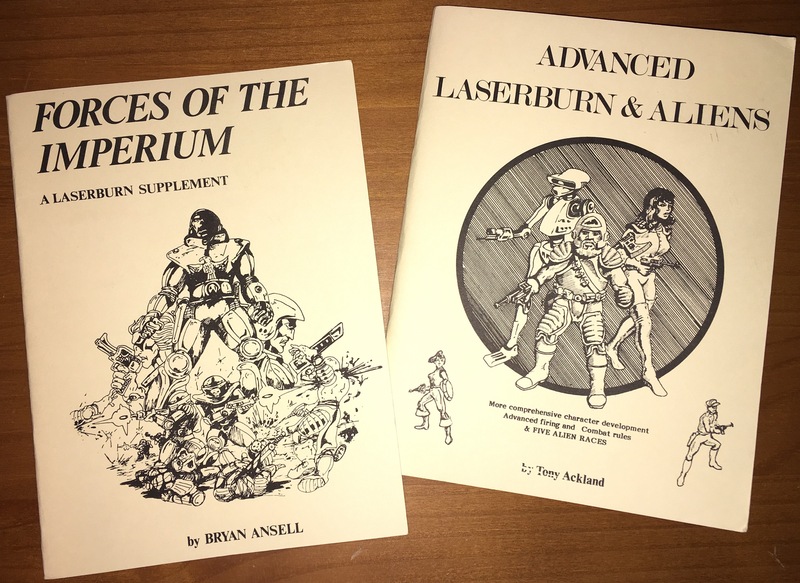 Laserburn is still available – along with additional supplements over at Alternative Armies. Well worth a look if you fancy exploring the world of Laserburn and 15-25mm skirmish gaming. 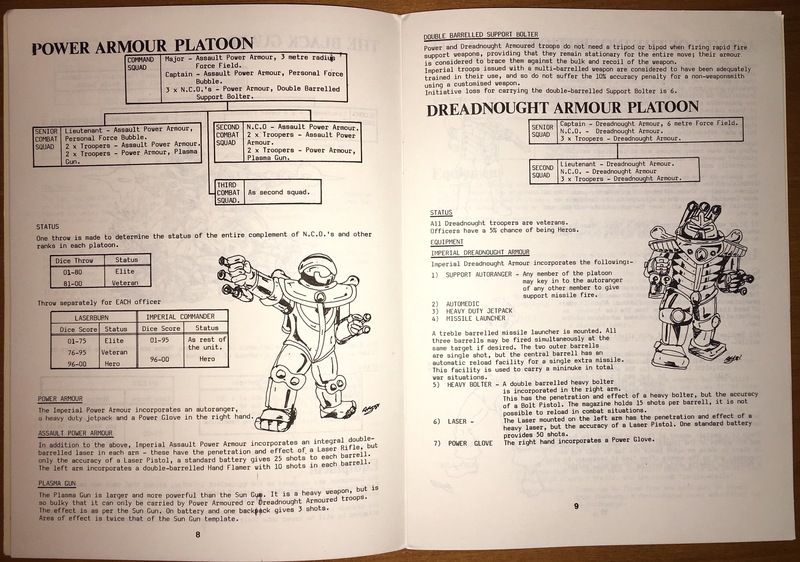 This entry was posted in Role Playing Games and tagged 15mm, 25mm, Citadel, games workshop, Grenadier, Laserburn, miniatures, Traveller, TTG. Bookmark the permalink. Good to see that they’re still out there . The art was mostly Tony Yates and Tony Ackland. We did a western gunfight game at about the same time: I illustrated that one. Various sad bastards are currently ripping us off I gather! We are still sculpting, writing and drawing: you will find us at the big Oldhammer yearly do in Newark. Are any of the adventures/scenarios still available anywhere? I let some slip through my fingers on ebay the other day – gutted? Unfortunately it seems to be really hard to get hold of published Laserburn scenarios. I look occasionally and though it seems to be relatively easy to get hold of the rules and supplements, adventures are usually nil. There is some fan written material (search for ‘laserburn’ on scribd.com) which does include some adventures. Good luck in your search! 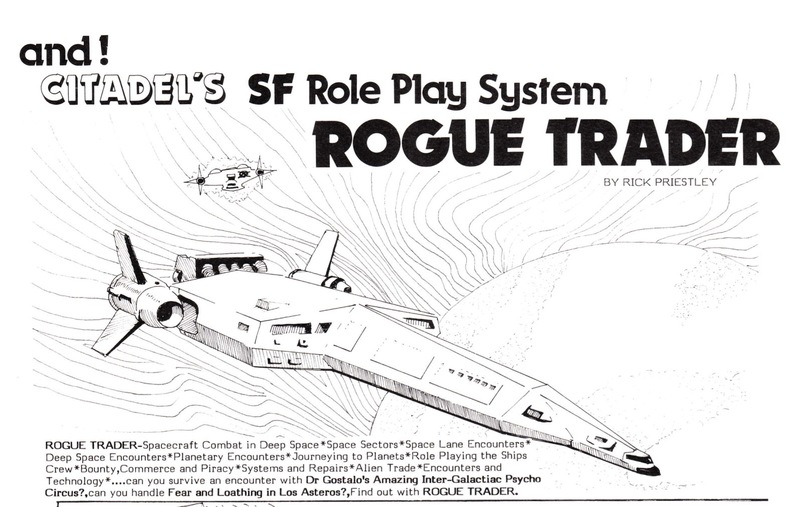 I almost forgot to mention there is the White Dwarf adventure ‘Shuttle Scuttle’ (WD49) which has stats for Traveller, Laserburn and Space Opera.